The APRL has one of the world’s largest and most accessible collections of philatelic literature. The collection includes books and journals about stamps and postal history, as well as the history of philately and related subjects like transportation and geography. Search the Library’s holdings using our online catalog or find information on a specific topic using our subject guides and finding aids. To find out how to borrow books or request copies of articles, see our services page. For more details about the kinds of material the APRL collects, see our Collection Development Policy. An author index and geographic index for 1886-1986 (volumes 1-100) are available from the library. The AP is available online from 2007-present for APS members on the AP Archive page. A comprehensive searchable digital archive is coming soon. The APRL Online Catalog, in addition to listing the book and journal holdings of the Library, also contains references to articles in philatelic periodicals and serves as the Philatelic Union Catalog, allowing users to search the holdings of the APRL and other major philatelic libraries simultaneously. The Piper File is a card index of 25 years worth of more than 25 philatelic periodicals through December 1969. The Stamp Lover Index covers worldwide philatelic publications up to 1976 and British Commonwealth publications after 1980. The Harris Index includes British Commonwealth periodicals up to 1925. The Ricketts Index is an exhaustive index of nearly 1,900 English-language periodicals published before 1925. The Index of Literature in the English Language that Describes Postage Stamp Forgeries, Fakes, Reprints, Fraudulent Postal Markings and Other Obliterations, compiled in 2004 by Theodore M. Tedesco and updated in 2014, includes book, periodical, and website references. The original index was published serially in the Philatelic Literature Review. The revised and updated edition is available online. In addition to the above, the APRL has many specialized indexes. While most of these are not available online, the APRL staff can copy sections of them for you. The Daniel Hines Air Mail Archives is the only known historical archives that extensively documents the pioneer period of United States air mail. 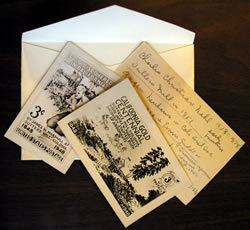 The collection was compiled by the late Daniel Hines, who corresponded with pilots and their relatives from the early, hazardous days of the transcontinental airmail route (1918-1927). The letters, photos, and artifacts in this collection reveal the hazards and the joys of the airmail pilots who flew “Hell’s Stretch” and refueled their planes at the Bellefonte airport. Browse through an inventory of this collection or search our online catalog for individual items. The American First Day Cover Society Archives include cachetmaker files and taped interviews with cachetmakers. The APRL Clipping Files include articles, press releases, photos, covers, first day ceremony programs, and other items. They are arranged by country, topic, or Scott Catalog number. Major portions of the collection came from Ernest A. Kehr (covering the world with emphasis on air mail, Switzerland, the Philippines, and Egypt), Harlan Stone (Switzerland), Forrest Ellis (new issues and designs for U.S. stamps from the first half of the 20th century), John Stark (stamps with fluorescence), and Belmont Faries (U.S. stamp design). The Elliott Perry – Cyril dos Passos Files include manuscripts and correspondence. Elliott Perry wrote extensively on all aspects of U.S. stamps, but much of his work focused on carriers and locals. Cyril dos Passos also wrote on many topics, including the 10-cent and 24-cent (1861-67) first and second issues, grills, and Bank Note issues. An inventory of this collection was published in the 4th quarter 2004 Philatelic Literature Review. Post Office Document Collections include forms from the Aaronsburg, Pennsylvania post office dating from the 1890’s to 1930’s and from the Milford, Iowa post office dating from 1891-1916. The State Revenue Society Library was donated to the APRL in 2008 and the Postal History Society Library was donated to the APRL in 1980. Books and journals from these collections have been interfiled with existing APRL holdings. The Colombia Panama Study Group (COPAPHIL) Library, the largest existing collection of references relating to the philately of Colombia and Panama, was donated to the APRL in 2008 and is located in 2 filing cabinets in the APRL. Czeslaw Slania Collection, this collection of stamps and related material is devoted to the work of the Polish/Swedish engraver Czeslaw Slania. The stamps are primarily from Sweden and Denmark, with some also from Greenland and the Faroe Islands. More detail in the finding aid - click here .